AvaTrade Review: is it a scam? Launched back in 2006, AvaTrade has been one of the mainstays of the online trading industry for over a decade now. With that in mind, it is indeed rather impressive that one will barely find any negative trader feedback about the operation. The complaints one can come across are few and far between and they mostly concern the lengthy deposit process, poor response times from the support staff and cumbersome withdrawals. On the whole though, everyone seems to be pleased with what AvaTrade has brought to the table. Based in Dublin and with offices in New York, Milan, Tokyo and Sydney among other locations, AvaTrade are present in some 150 countries. Their regulatory status is rather impressive as well, to say the least. AvaTrade are licensed by Australia's ASIC, by Japan's FSC as well as the Financial Services Commission of the British Virgin Islands. Working under the direct regulatory supervision of the Bank of Ireland, the operation is compliant with the EU's MiFID regulations. AvaTrade offers good promotions, a superb suite of educational resources, great reputation, low spreads and a very attractive minimum deposit of only $100. Click here for an AvaTrade bonus up to $15,000! Platform-choice-wise, AvaTrade's customers are truly spoilt: there are no fewer than eight different platforms, every one of which covers an essential aspect of the Forex and CFD trading scene. One of their most interesting additions is the Automated Trader, which makes use of systems like ZuluTrade, MirrorTrader, Currensee and Ayondo, effectively allowing traders to copy the moves of their more successful peers. 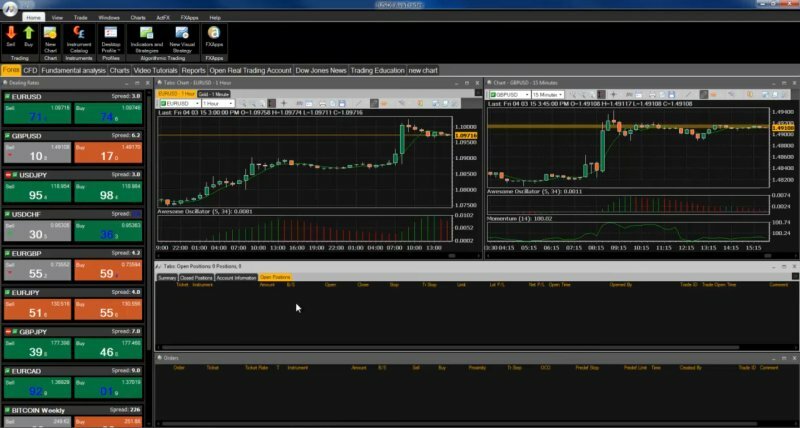 AvaOptions is one of the recent additions to the lineup: it allows traders to combine FX options with FX Spot trading, for various hedging and profit-maximizing opportunities. Mac Trading is dedicated to those using Apple's platform, while the Mobile Trading platform covers mobile devices, powered by MT4. The MetaTrader 4 platform is the centerpiece of the AvaTrade platform lineup. With its powerful technical analysis tools, intuitive interface and flexibility, it is the perfect fit for beginners and advanced traders alike. The MT4 Floating Spreads platform gives traders access to the attractive spreads of the interbank market. The Web Trading platform is the no-download solution offered by AvaTrade, which does exactly what it says on the package. Read more about the AvaTrade platforms. Avatrade gives you free access to the Autochartist technical analysis tool, which identifies strong trading opportunities in over a hundred financial instruments. The tool recognizes chart patterns, Fibonacci patterns and key support and resistance levels. On top of that, it also gives a quality score to each pattern it has found. Autochartist is available free of charge in the AvaTrader platform, click here to find out more. Mirror Trading was developed to share strategies of experienced traders and strategy providers. You can follow a whole strategy or just simple trades. With the Mirror Trader Platform, you can now even mirror premium trading strategies provided by leading hedge funds. The mirroring is fast and reliable, executed automatically 24/7. Click here to find out more about Mirroring. Accounts-wise, AvaTrade have obviously opted to keep things as simple as possible: they only offer two account variants, one of which is a demo account, that comes with $100,000 in virtual funds, allowing the trader to explore every nook and cranny of the AvaTrade universe, risk-free. The other account is the real money account, which features a minimum deposit requirement of only $100. Surely, gaining access to the multitude of fundamental and technical analysis tools delivered by AvaTrade, is worth that sum alone. The real money account is split into four different levels. The base level is the Silver one, followed by Gold, Platinum and AVA Select. These levels offer progressively better access to the various features of the operation. AvaTrade do not charge any commissions, but they do have a spread on all their quotes, a spread which ranges from 3-7 pips - a little bigger than what most of their competitors charge. The AvaTrade support staff is available 24/5, and they can be contacted in multiple languages. The site itself is available in 12 languages. The channels through which support can be reached include email, live chat and phone - with local numbers available in 30 different countries. With a decade of service under their belt and with a rather clean reputation, AvaTrade are among the safest and most reliable Forex brokers. Their promotions attractive and their platform-variety plentiful, AvaTrade cater to beginners and experienced traders alike. At this point in time, the answer to that question is a positive "No". The operation isn't perfect though, so small hiccups can occur here and there, with trader deposits, withdrawals and some support-related issues. Click here to visit the AvaTrade website.